This little case, in addition to illustrating practice pointers about fee requests that apparently need illustrating, is an example of how judicial fashion changes. Thirty years ago this opinion might have been tossed out in three pages, especially in Division Two. Ten years ago it would have taken twelve. This year it takes just over six, which is about right. Defendant then moved for an $82,000 fee award under 12-1103 (quiet title). Plaintiff objected, arguing that Defendant wasn’t the prevailing party — that the case was basically a “draw” — and that she shouldn’t recover fees for claims Plaintiff won. 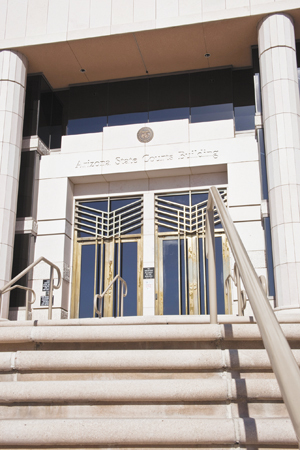 The trial court found Defendant entitled to fees under 1103 and awarded $50,000. Instead Plaintiff argued vaguely that the amount of the request was unreasonable, without analyzing Defendant’s China Doll affidavit and pointing out which fees were unreasonable or unrelated to quiet title. Defendant showed nothing in the record to indicate that the trial court abused its discretion. Of course the fact that the trial court awarded only about 40% of the requested fees killed this appeal once the prevailing-party issue was decided. What did Defendant say about that reduction? More of the above but also that it was arbitrary because “neither party argued for a 40% reduction.” Which adds a final practice pointer: any ill-considered idiocies floated in your brief or at oral argument will quite likely be used against you in an appellate court of law.